The Gion Festival. Literally, from the 1st of July until the end of the month, traditional rituals and events related to this massive event are held almost every day. 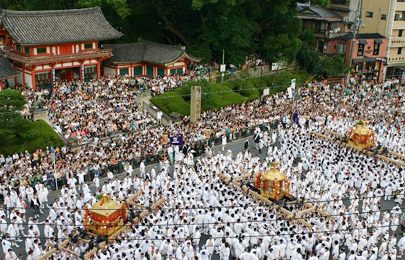 Join the Gion Festival and experience. The wonder of Japan through this magnificent celebration with more than 1,100 years of history. There are mainly highlights during the Gion Festival: the procession centered on yama and hoko floats, the Mikoshi portable shrine event and the traditional dance performances dedicated to the deity. But it is the mikoshi themselves that hold pride of place as the most important spectacles of the entire festival. 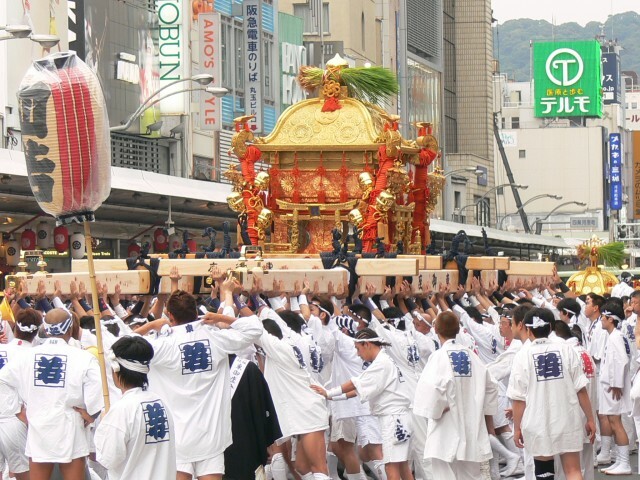 Mikoshi are the so-called ”portable shrines” in which the spirit of Shinto deity is transferred. Participants carry the mikoshi on their shoulders to move the sprit from place to place on Sinko-sai(17th) and Kanko-sai(24th). At Shink0-sai, three mikoshi will be carried from Yasaka Shrine to Otabi-sho (the resting place for mikoshi). The process is reversed at Kanko-sai, when the three mikoshi are carried back from Otabisho to Yasaka Shrine. These days, dedicated to the deity of Yasaka Shrine are the centerpieces of the entire festival. In Chinese characters mikoshi literally means the “Vehicle of God”. It is unique to Shinto and carrying mikoshi at village festival is said to have begun in the Muromachi period (1336-1573). Mikoshi are highly sacred objects that help to create a direct connections between the deity and humanity, purifying the area and energizing people. It is for this reason that as a sign of love and respect to the deity they are carried above everybody on the carrier’s shoulders. In the same manner, while resting during the procession, the mikoshi is never put on the ground but instead placed on a specially constructed frame. On the day of Shinko-sai Festival all three mikoshi and their carriers gather in front of Yasaka Shrine at around 18:30, creating an extremely powerful and amazing scene. 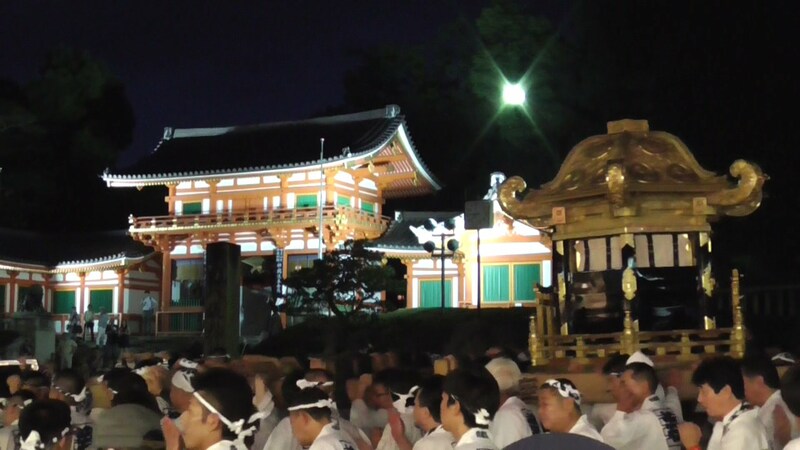 The climax finally comes at the very end of the Kanko-sai Festival, the three mikoshi return to Yasaka Shrine (around 22:00-22:30), and the deities are brought back to their home. Around midnight, all the participants are suddenly enveloped in complete darkness and silence – creating a truly sacred moment. Without a doubt, the mikoshi is what connects the people of Kyoto and their guardians with a strong tie in the Gion Festival.